Fixed Dip Pipes are fairly rigid, thick wall PTFE tubes, either straight or 90˚ elbowed, which are directly crimped to the end of Bioflex Ultra hoses. 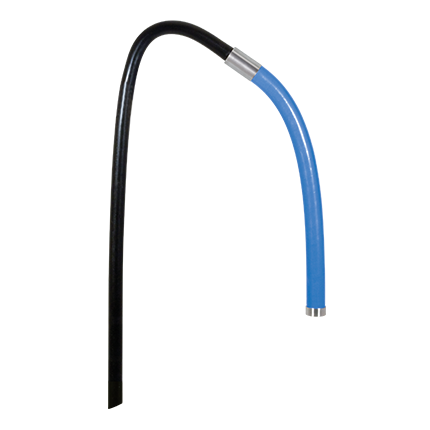 They are designed for insertion into drums, tanks and reaction vessels in order to suction drain (or inject) process fluids transferred through the hose. 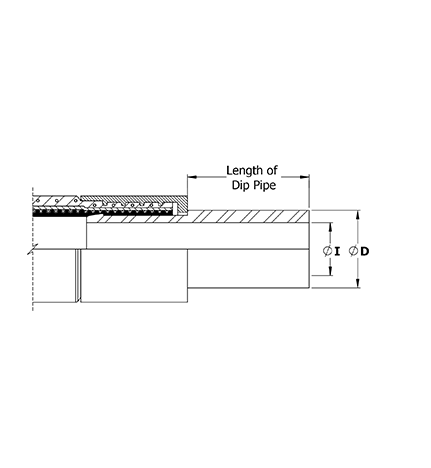 Specify the size and material of the dip pipe, whether it is straight or 90˚ elbowed. Give the length of the straight leg of the dip pipe and the length of the rest of the hose assembly separately. Dip Pipes are normally only tested to 6 Bar Pressure, and are not suitable for use at pressures higher than 3 Bar. They are usable at negative pressure up to -0.9bar vacuum. If higher pressure ratings are required, consult Aflex Hose. Dip Pipes are supplied as standard in 1 metre straight lengths, but can be supplied in any length to individual requirements. As Fixed Dip Pipes above, but connected to the hose through an end fitting, not by crimping direct to the hose. A straight, or 90˚ elbowed anti-static PTFE Dip Pipe, fitted with a Flange or Cam & Groove Male PTFE Lined & Flared end fitting. The most usual end fitting is a Cam Male (as shown), so the dip pipe can then be connected to a hose with a Cam Female end fitting.